For a teeny-tiny dog seeking a home in a daunting world, big hopes — and a bit of ingenuity — go a long way. Itty Bitty is a very, very tiny dog. But when he finds an enormous bone, he goes straight to work, gnawing out doors and windows and hollowing out the entire inside. When his work is done, however, his cavernous house still feels incomplete. Where can he find some itty-bitty things that will make this bone a home? 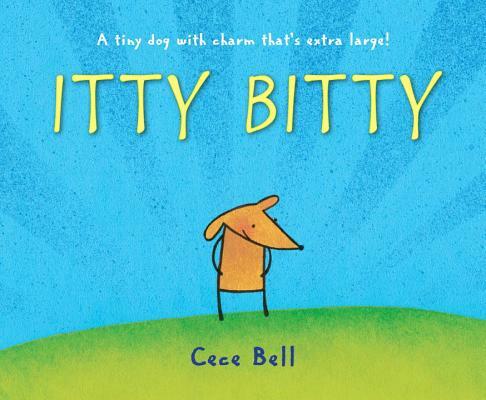 Everyone from dollhouse lovers to grown-ups setting up a home of their own will fall for this comical tale of an optimistic canine who is small in stature but huge in charm. Cece Bell is the author-illustrator of SOCK MONKEY GOES TO HOLLYWOOD, SOCK MONKEY BOOGIE-WOOGIE, SOCK MONKEY RIDES AGAIN, BEE WIGGED, and the board books BUSY BUDDIES AND FOOD FRIENDS. She lives in Christiansburg, Virginia. Unpretentious, endearing, and enormously satisfying, this little book is one that children will ask for again and again.